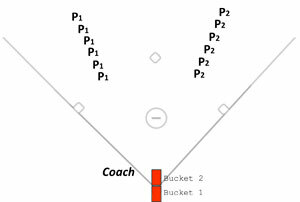 Split your team up into 2 groups, one goes to shortstop area and the other to 2nd base area. Everyone has their glove on. REMINDER: if you’re a Vault Classic member then you already have ALL of the Throwing eSkills and ALL of the Throwing eDrills in your locker!